Eight men were found guilty on Thursday of exploiting 92-year-old Liliane Bettencourt, the richest woman in Europe. 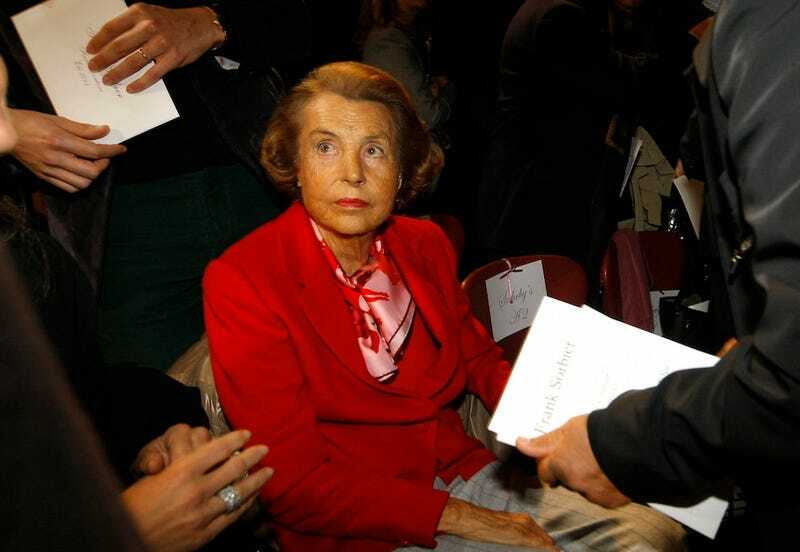 Among those sentenced to prison for exploiting 92-year-old Liliane Bettencourt were her chief financial advisor, a business associate and her closest “friend,” society photographer François-Marie Banier – who during a 10-year period received over $1 billion in gifts from the L’Oréal heiress. The five-week trial, which Bettencourt herself did not attend, took place in Bordeaux and ended in February. 9 out of 10 of the defendants stood trial; the tenth, her nurse Alain Thurin, attempted to commit suicide the night before the trial began. The “Bettencourt Affair” has been a huge story in France for years, beginning when Bettencourt’s estranged daughter Francoise Bettencourt Meyers filed a lawsuit in 2007 alleging that her mother was unfit to manage the estate. Prosecutors and Bettencourt’s family, however, painted Banier as a manipulator who abused her generosity and failing mental health while conspiring to make himself her sole and unique heir. For a deeper look, Vanity Fair published a by-the-numbers roundup of the Bettencourt Affair here.